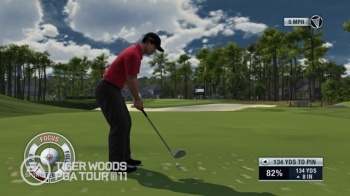 Could EA's Tiger Woods PGA Tour be on its way to becoming Lee Westwood PGA Tour? After Tiger Woods' marital infidelity was exposed in late 2009, many sponsors chose to abandon him, but EA still kept Woods on as the star of its flagship golf videogame Tiger Woods PGA Tour. Despite Tiger's massive popularity as a golfer, EA recently said that he still has to live up to his end of the deal and start winning, or else pack his clubs and go. At the Reuters Global Media Summit in New York, EA CEO John Riccitiello said he wasn't threatening Woods, but that EA was sticking with him "because he has the promise of being the world's best golfer." He explained that the world's best golf game has to star the world's best golfer, so if Woods isn't that golfer EA might have to consider a change. Woods hasn't won a tournament since the scandal. EA originally said it would stick by Woods due to his prominence as an athlete, believing that sales of PGA Tour were unaffected by the scandal in early 2010. However, when Tiger Woods PGA Tour 11 was released in June, its sales were way down. It's these sales that are likely driving EA to reconsider who should be featured in PGA Tour, but Riccitiello said EA is "willing to give [Tiger] the benefit of the doubt for a period of time," though he didn't say how long this period of time would last. Woods is still ranked as the #2 golfer in the world, having been bumped down by British golfer Lee Westwood five weeks ago. He might not be winning, but Woods has been the face of EA's PGA Tour for 13 years. Can another golfer really sell the game any more successfully?